Poor posture when using computers, laptops and tablets is one of the biggest causes of neck and back pain, and it’s having a serious effect on productivity at work and on personal life in general. People who experience pain or discomfort are unlikely to perform to their full potential, and this often leads to sickness absence – and, in some cases, long-term injuries and disabilities. Research undertaken by ergonomic workstation specialists Fellowes reveals that 79% of us admit to slouching at a desk. Add to the fact that most people spend over seven hours a day sat at a desk and you begin to realise the full extent of the problem. Fellowes offers a comprehensive range of head to toe ergonomic solutions – from FIRA accredited monitor and laptop risers, back supports and foot supports, to wrist supports with Microban antibacterial protection, a coordinated range of inspirational home office accessories, and ingenious products for keeping you organised and comfortable whilst working on-the-go. 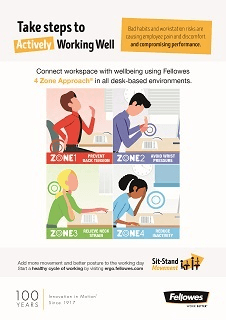 To make it easier for you to choose the right ergonomic solutions for you and the way you work, Fellowes has developed the 4 Zone Approach to healthier working. In four simple stages, you can identify the most common bad habits, the potential risks and the most effective solutions for workstation-related pain and injuries – wherever working is taking place. By adopting good posture and ensuring your eyes, neck, back and legs are positioned correctly, you will discover a world of difference to the way you feel, both physically and mentally. This in turn ensures that you are much more engaged, motivated and productive. To discover more about healthy, happy working with ergonomic workspace solutions, visit fellowes.com.